This blog is written by Greg Fliney, Samuel Hine, and Matthew Almanza. The endosymbiotic hypothesis concerns the origin of mitochondria and chloroplasts, two organelles contained within various eukaryotic cells. 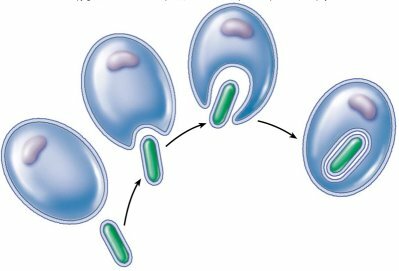 According to this hypothesis, these organelles originated as separate prokaryotic organisms that were taken inside a primordial eukaryotic cell. Such symbiotic relationships in which two species are dependent upon one another to varying extents served as crucial elements of the evolutionary progression of eukaryotic cells. The endosymbiotic hypothesis has developed greatly over the past century. Continued research on this topic has resulted in a considerable amount of evidence and support for this hypothesis, often referred to now as the endosymbiotic theory. With this research, the endosymbiotic hypothesis has been extended to include the evolutionary significant concept of secondary endosymbiosis, which adds to the complexity of the evolutionary process. The true significance of the endosymbiotic hypothesis becomes poignantly evident, however, when actually relating the scientific basis of this concept to actual examples of endosymbionts in nature.